Adobe Premiere Pro CS5 For Mac software offers breakthrough performance for video production on Mac OS X, enabling you to work dramatically faster thanks to the revolutionary native 64-bit, GPU-accelerated Adobe Mercury Playback Engine. Work natively with the video formats you want and accelerate production from scriptwriting to editing, encoding, and final delivery. Capture and log footage from virtually any camera - including tapeless cameras. 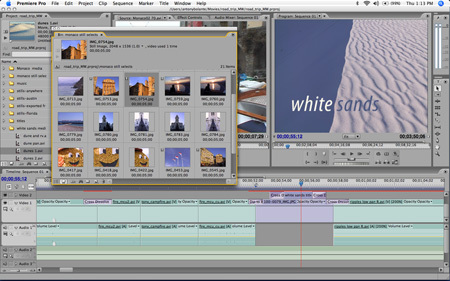 Adobe Premiere Pro CS5 For Mac offers breakthrough performance for video on Mac. Import and export Apple Final Cut Pro and Avid projects in Adobe Premiere Pro CS5 For Mac so you can explore new possibilities with After Effects, Photoshop, and other Adobe software, bringing timesaving integration between Adobe tools to projects created in these other NLEs. Qweas is providing links to Adobe Premiere Pro CS5 For Mac 5.0.3 as a courtesy, and makes no representations regarding Adobe Premiere Pro CS5 For Mac or any other applications or any information related thereto. Any questions, complaints or claims regarding this application Adobe Premiere Pro CS5 For Mac 5.0.3 must be directed to the appropriate software vendor. You may click the publisher link of Adobe Premiere Pro CS5 For Mac on the top of this page to get more details about the vendor.